It’s been a real drag missing so many shows this year, but I’ll be there for closing night. Meanwhile, I’m still doing my damnedest to keep up with the action. 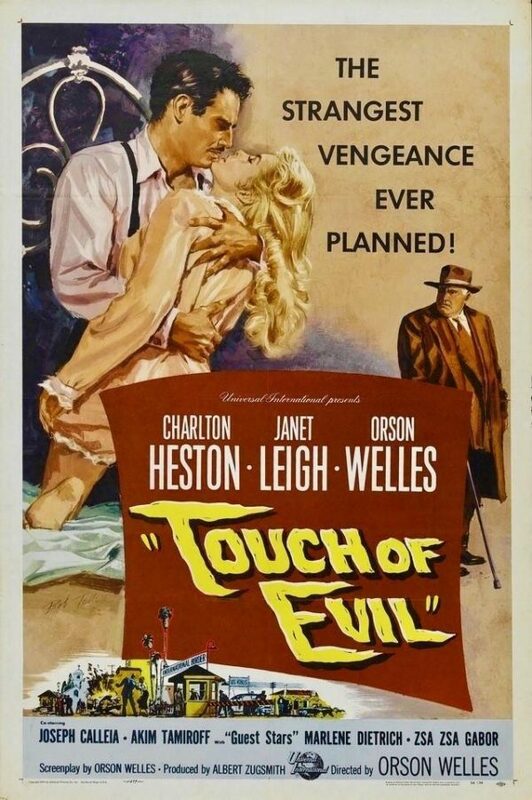 To that end, let’s get into last night’s first movie TOUCH OF EVIL. A Mexican drug enforcement official, played by Charlton Heston (!!!!!) 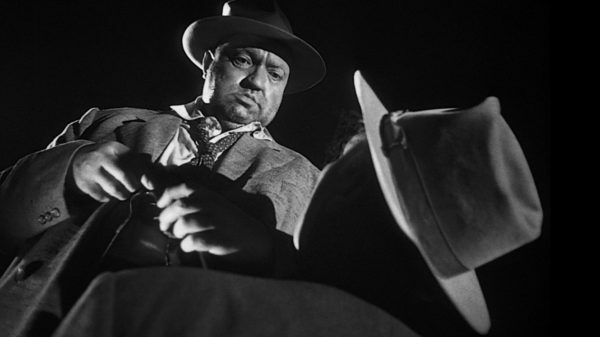 is investigating a car bomb in a sleazy border town when he and his pretty new American wife get sucked into seemingly bottomless corruption lead by Sheriff Hank Quinlan, a shambling mountain of flop-sweat and drunken hostility masterfully played by writer/director Orson Welles. Did I mention there’s a lesbian girl gang? Ok, so here’s the thing about this flick. If you haven’t seen it yet, you’re better off going in knowing as little as possible in advance. Besides, the plot is almost beside the point. 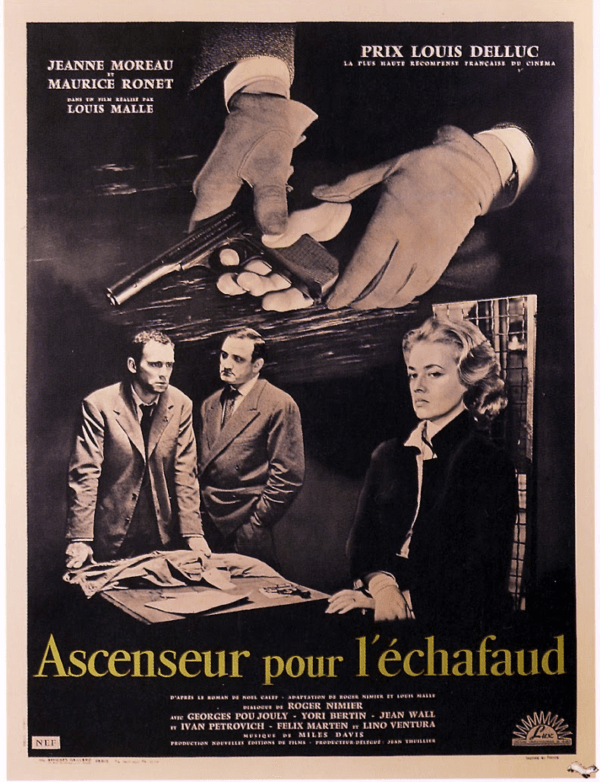 From the famous, continuous 3-minute opening shot to the final, fevered showdown, it’s a dark, almost hallucinatory trip and you’re better off just going along for the ride. There’s a lot to both love and hate about this film, which in my book means it’s worth seeing. That way, you can decide for yourself. 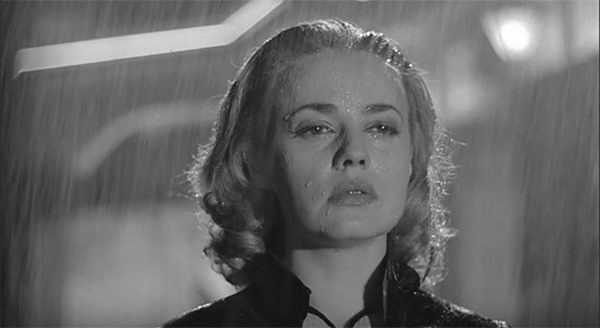 Sad-eyed blonde Jeanne Moreau is married to a powerful arms dealer but having a mad, passionate affair with one of his employees, a war vet named Julien. The two conspire to kill hubby and make it look like a suicide so they can run away together. The plan is meticulous and flawlessly executed and goes off without a hitch, except for one small detail. Julien forgot to remove the rope he used to climb from his own office below to the suite above. Realizing this at the last minute, he heads back up to grab it, only to get stuck in the elevator when the power goes out. 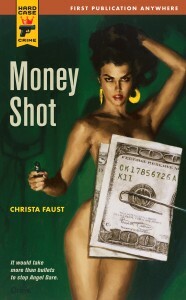 Hence, the title. This is one that I’ve seen before, but never in the theater, so I was really sorry to miss it last night on the big screen. 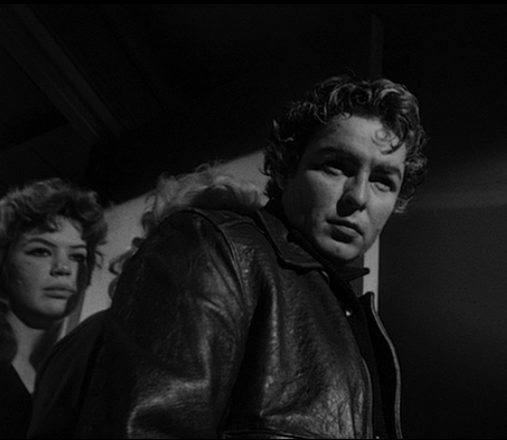 The scenes of Moreau walking through the night streets of Paris are haunting and unforgettable, and chances are if you haven’t seen this film, you’ve probably seen this iconic image. Also, I’d be remiss if I didn’t mention the legendary jazz score by Miles Davis, which was apparently improvised in front of a projected rough cut of the film. 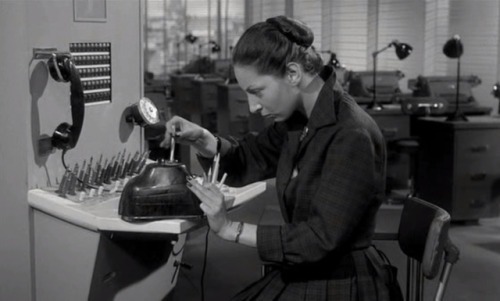 Before we get too highbrow here, let me point out that I have always had a bit of a crush on the switchboard girl from this movie. She can sharpen my pencils any time. Tonight, we wrap up the year with I WANT TO LIVE and CRY TOUGH. I’ll be there, not square.